We are delighted to let you know that we will be the Rochdale AFC jersey sponsors for the forthcoming 2013/14 season. “After finishing 12th in the 2012/13 season, we are confident that The Dale can improve on that performance when the new season starts in August. The team play many games throughout the country and this is a great way for our name to be seen by many people. Many of our staff members come from the Rochdale area and since our business originated in Heywood, it seemed like a natural relationship to form with our local football team”, explained Matt Greensmith, the MD here at Crown Oil. 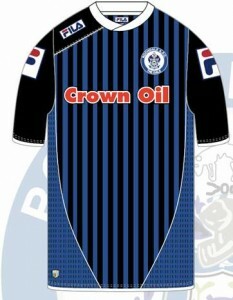 Crown Oil joins the Carbrini brand of JD Sports to complete the sponsorship of the Rochdale AFC kit. “We are looking forward to working with Crown Oil and hope that this sponsorship is just the beginning of great things to come. Becoming the shirt sponsors requires a great commitment and we’re delighted that Crown was able to offer that given that is was quite a tough time for us trying to get sponsorship” stated Iain Johnstone; Sales and Marketing Manager at Rochdale Football Club. 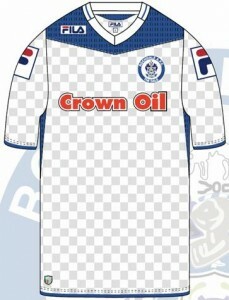 When Can I See The New Rochdale AFC Jersey? Rochdale AFC will debut the new kit at friendly matches against Northwich Victoria on Tuesday, 9th July 2013. However, the kit will make its Spotland Stadium debut on Saturday, 20th July 2013 in a friendly match against local rivals; Blackburn. Come down and cheer on ‘The Dale’ when the new season kicks off on Saturday, 3rd August 2013, where Rochdale AFC will take on Hartlepool at Spotland Stadium. The production of next season’s kit is now underway and supplies are expected in July. However, Crown Oil has managed to get a sneak peek of the new kit. Leave a comment and let us know what you think of the new jerseys. Which one do you like best?